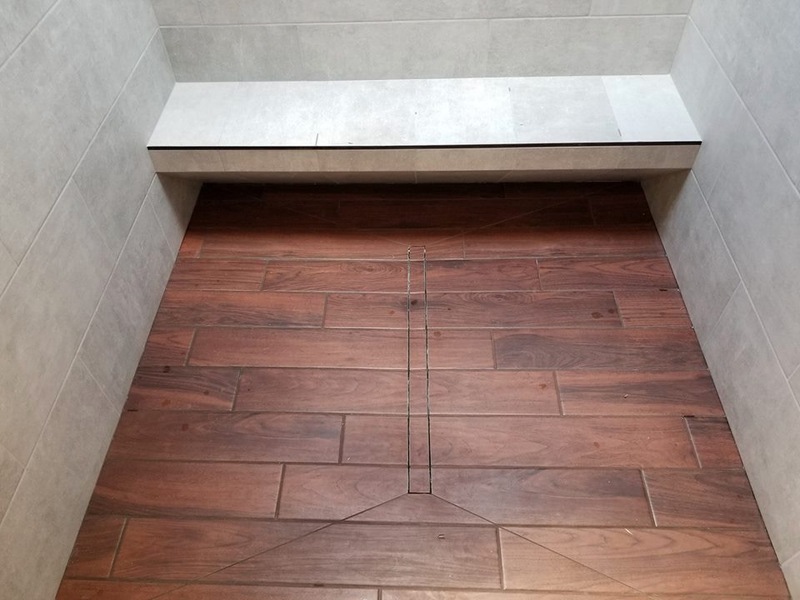 I have a project coming up where I need a 36" wide x 60" long curbless shower linear drain install. 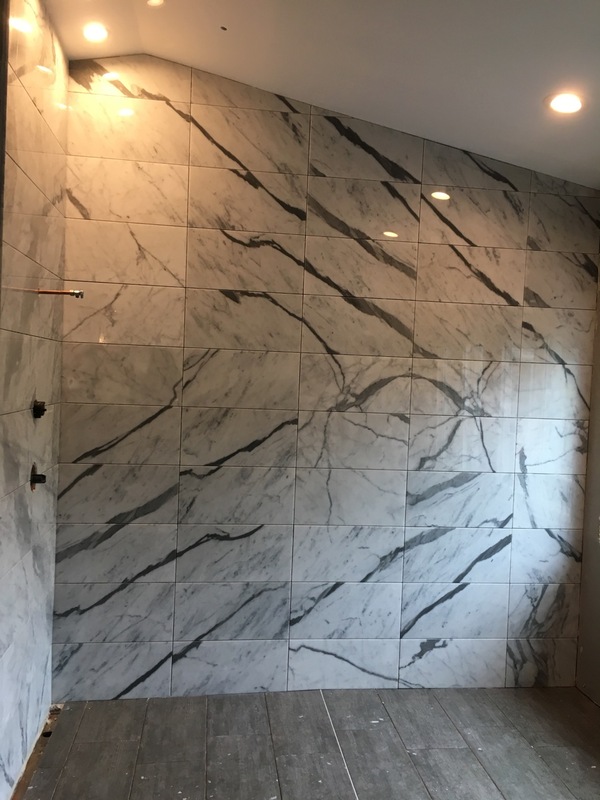 Problem is shower is open on one side and along front limiting pan thickness. I have looked at Arc trudeck, too small of a pan 32x51, Wedi and Kerdi both would be too thick and need a curb along one side which client may be ok with. I have used VIM center drain but client wants big tiles. Any others out there that would work? 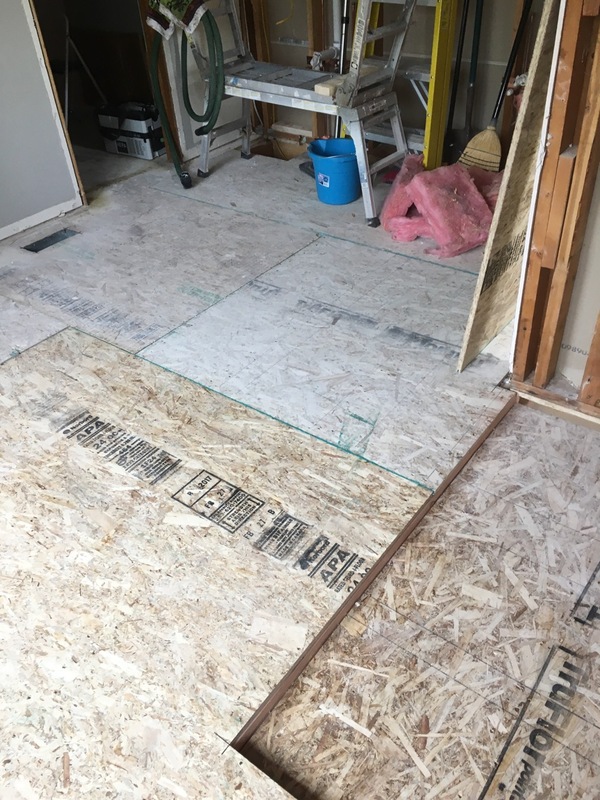 I am planning on removing sub floor, cleating joists etc... so I have 3/4" recess. Rest of floor will get ditra heat and Nuheat cables. Locating the drain on the long outside wall? 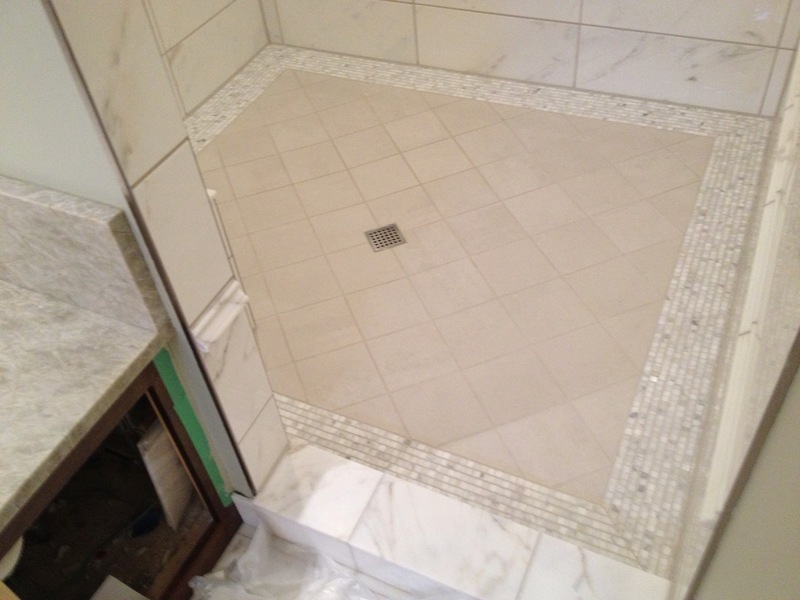 You can do a center drain with large format, just have to cut the "hip" tiles. Are you heating the shower floor? 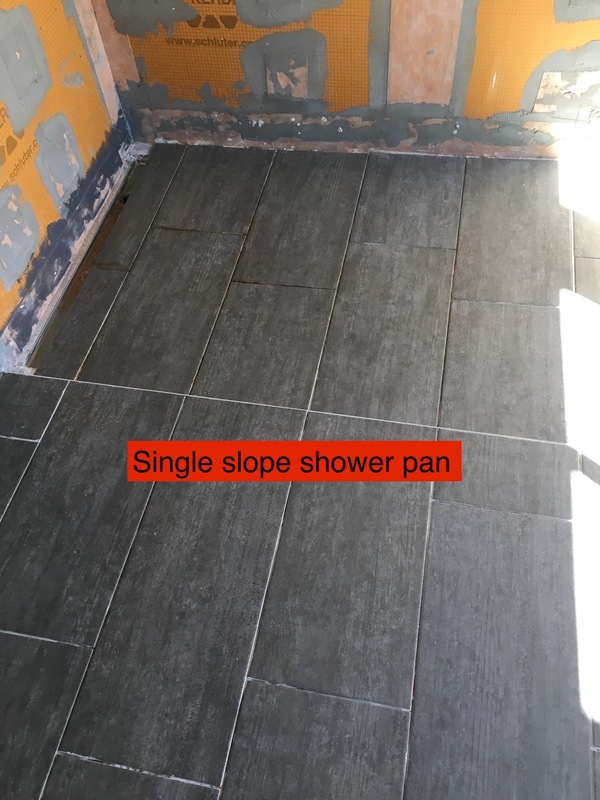 If you're not heating the shower floor use the 76x38x 1-5/8 Schluter pan, by the time you trim off the 2" you'll be at 1-9/16, add the heat mat height to the bathroom floor and you're at approx 1-1/8" height, slice the balance off top of the pan, cover cut area with Kerdi. Make sure you install a wicking barrier between the pan area and main floor. I use Dilex expansion strip. Hey Tom was hoping you would chime in. No heat on shower floor as I think that may build it too much with addition of ditra heat membrance on top of pan. Best choice for them would be valve wall location. 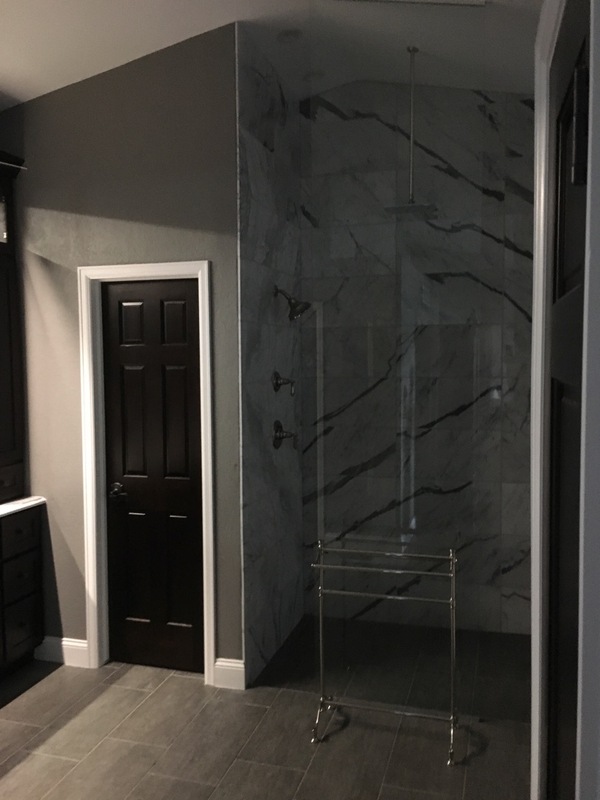 My choice would be at long back wall versus glass door. I was looking at the 76x38 as it seems to be the best choice as I think your correct that by the time I cut it down to 60x36 I would lose enough thickness to be close and could shave down pan and cover with Kerdi. 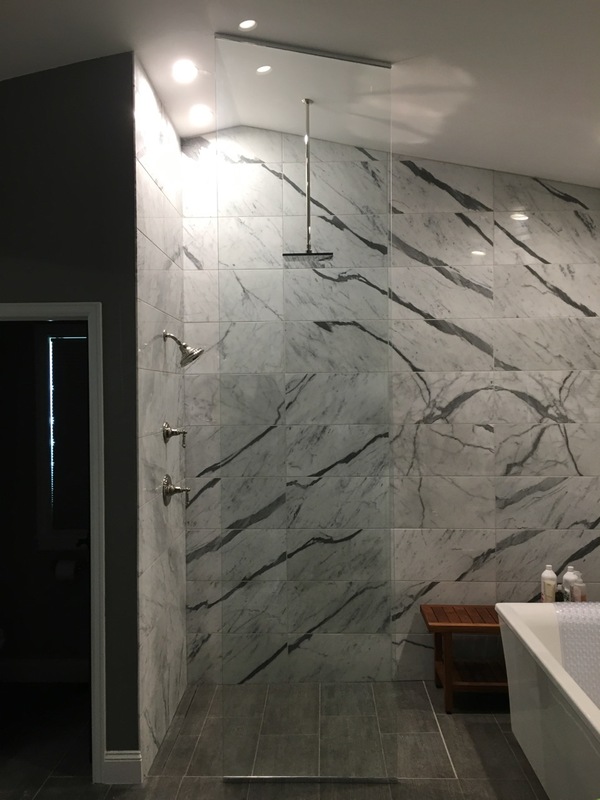 If you're going shower valve wall, you'll need the 36x72 not the 76x38. By the time you trim it to 60" it will be 2" tall. This job is in Highlands Ranch. Show them these pictures, you can see the pitch and how it interacts with the room floor. 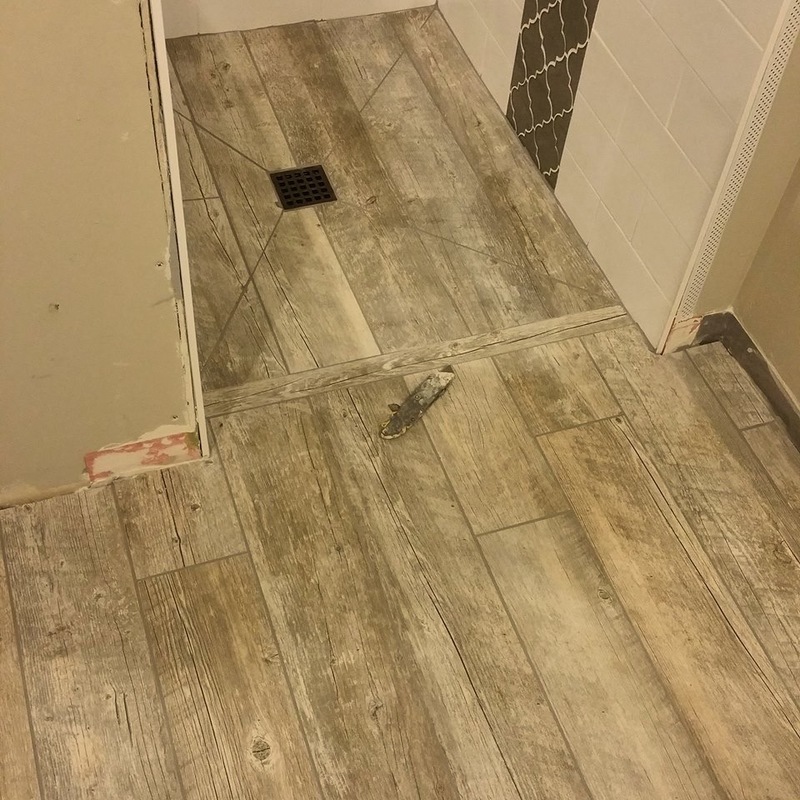 I don't uses the Schluter trim for this, I cut the pitch on the tile. You have to start at the low point, this means trimming the tile on the level floor. 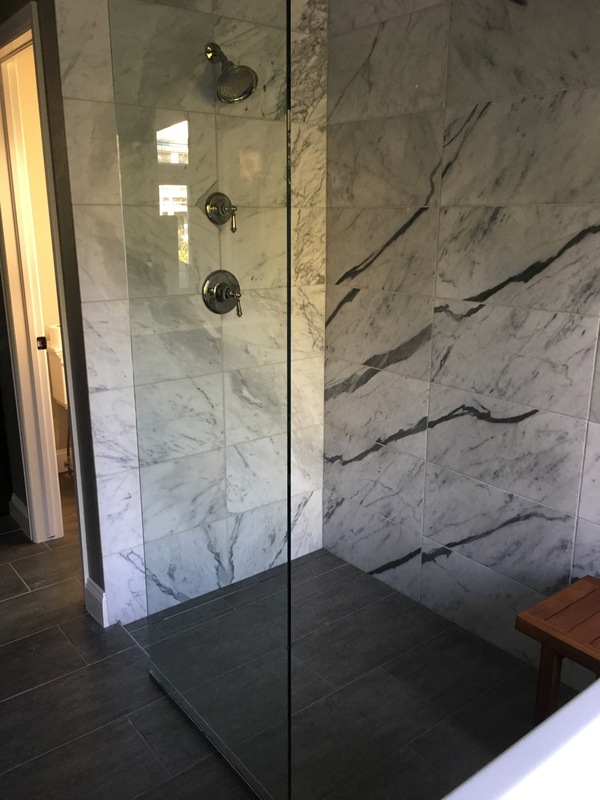 The gray line at the exit of the shower is the Dilex I used for the wicking barrier. This shower floor is heated. I use Ditra Heat cable. As I mentioned large format is possible. First photo is my work (8x8 is not really large format by definition), the other two are used with permission of the installers. How deep is the recess for the pan? Looks deeper than 3/4 for some reason. All in all it seems easiest choice would be the 76x38 as it is thinner and puts drain at back wall. It is deeper than 3/4. I used the 36x72 pan to get the drain at the mixing valve wall. Probably 1-1/4". Trimmed the joist and doubled where necessary, due to the 72" tub and joist span I had to double up others anyways. So it seems pan is 7/8" thick at drain body edge of pan so I think I can put drain at door and raise drain body 5/8" or so to match field tiles. That sound about right? Last edited by kevjob; Yesterday at 05:59 PM. Give Rod Katwyk a shot. He is the king of custom foam pans. Actually the king of custom foam anything. No reason to slice and dice a Schluter pan. He will make a pan to any spec (within reason). His pans work with kerdi line? Have all the testing done for permitting? If your job is in Douglas county the inspector has no clue how to inspect a barrier free shower. This one is in Wheat Ridge which I have heard can be a pita. They want 2 weeks just for plan review for a bathroom! , Douglas County in an out in 30 mins. It was about 2 weeks for the Douglas county permit for the job I posted the pictures of. They wanted an arc fault breaker on the heat floor, problem was it's a 2 pole floor circuit which does not require an arc fault. Yep! He will even premount the fabric. Have a call into Schluter rep and see what he says. 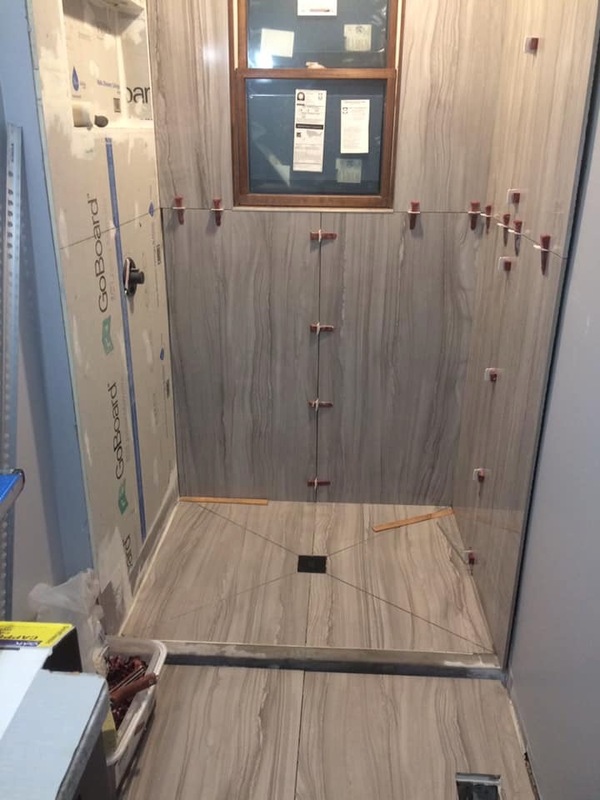 I am pushing for curb opposite of valve wall and put drain at entrance of shower which I think will solve all the mental math of flat field tile and sloped pan tiles meeting up. Huh, never seen them take more than 45 mins even for kitchens with structural mods. There are a couple smart guys I deal with regulary that I know by name and couple that have no idea what they are looking at!